By faith and faith alone. Mountain berries split the bone. With the cave crumbling all around them, Richard calls for his friends to jump across a widening chasm in the floor. 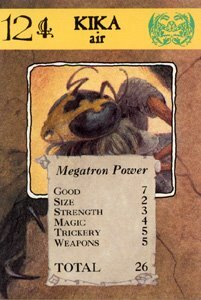 Orkan and Melek leap across the gap just before the ground where they were crumbles. 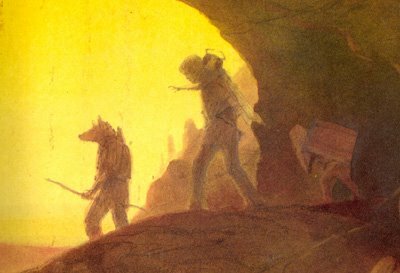 Urging his friends to follow him, Richard leads his companions to the other side of the cavern, where they begin scaling the crystal outcrops to a narrow hole in the wall. After a while, they emerge from the tunnel into a cave bigger than Zibella's. In the middle of the enormous cavern stood a huge mound, and Orkan suggests climbing the hill to get a strategic strongpoint. 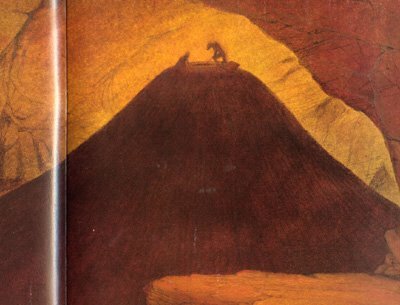 The trio climb the hill and find a deep hole at the peak. 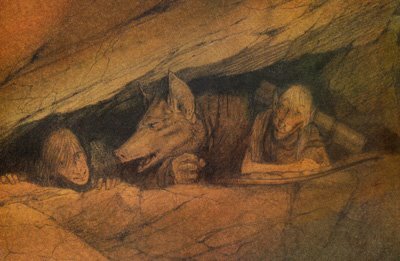 They curiously peer down into the bottomless pit when suddenly they hear an eerie wail coming from inside. They prepare to run, but they hear an unmistakable cry for help when the wail calls out once more. Richard asks the person down the shaft how far the bottom is, but the person cannot tell and repeats the cry for help. Richard notes metal spikes outlining the inner sides of the tunnel, obviously a deterrant to stop the victim from climbing out. He believes that the spikes can take some weight of someone lowered down the shaft by rope, but it all depends on how deep the shaft is. Stumped, the trio consult the Book of Prophecies. After reading the day's riddle, Richard surmises that if they have enough faith, the rope should be long enough to reach the shaft's bottom. Orkan states that Melek should be lowered since he is the smallest, and the dwarf reluctantly agrees. With Richard and Orkan holding one end of the rope, Melek scrambles into the tunnel. As he climbs down, he wonders if the rope is long enough, but then remembers this idea depends on "faith and faith alone" and removes all doubt from his mind. After a few seconds, Melek realizes the plan is working, as it becomes clear that the rope is stretching beyond its original length. Feeling more confident, Melek carefully climbs down the spikes towards the bottom, where he firsts adjusts his eyes to the dim light before looking for the person he had come to rescue. On the floor of the shaft he finds a wasp-like creature with a terrible wound in her leg. 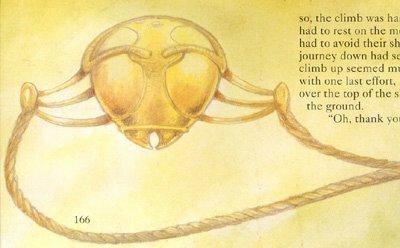 Melek asks the insect creature to hold onto him as he climbs up, and the wasp does so. She is surprisingly quite light, but even so Melek finds the journey back up the shaft tedious and painful as he has to rest several times while avoiding the deadly spikes. Eventually, after a long climb, he manages to bring the wasp lady out of the pit and at the top of the hill, where Richard and Orkan are waiting for them. The wasp immediately thanks the trio for saving her and introduces herself as Kika, Guardian of Insects. She reveals that she had been captured by Klaw, the Evil One's servant, and he had taken her weapons before throwing her in that hellish pit to die. Melek asks why she couldn't fly out; Kika unfurls her flimsy wings and points out the spikes that could've torn them to pieces. Kika then asks the three who they are, and Richard reveals he is the Chosen One and explains his adventures and quest. Kika offers her assistance and says that a Lifeforce Pod is located in Sand City, but Klaw will try to stop them from reaching it. She then unties a narrow belt from around her waist and gives it to Richard, stating its magical powers will help him when he needs it most. Upon putting on the belt, Richard feels a surge of strength throughout his body. With the knowledge of a pod located in Sand City, he says that that shall be their new destination. When Melek points out Kika's bad leg wound, Richard hoists the weak Guardian onto his back and carries her. After making their way down the mound, Kika directs the trio through a series of winding tunnels until they finally emerge into the open. They finds themselves on the outskirts of an enormous desert, and in the distance they can see the outline of a city against the horizon. With their destination in sight, the four begin their trek across the desert. The ground is firm beneath their feet, but the waving ridges practically double the distance they need to travel. As they travel, Richard realizes how dangerous the situation is: the ridges can easily hide an army, one they wouldn't see until they they walk right into it. He is about to say something to Orkan when a loud laugh echoes across the desert. Looking up, Richard's heart sinks when he sees an evil-looking skeleton man standing at the top of the ridge. Realizing that this creature has to be Klaw, Orkan orders his friends to get out of the gully and run. Klaw laughs at the four's attempt to escape. From his hand he throws out several small chunks of bones across the desert. 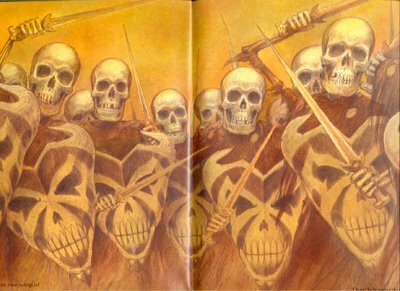 From where the bones land, a forest of skeleton warriors emerge, each brandishing a menacing bone sword and a shield in the shape of a twisted skull. 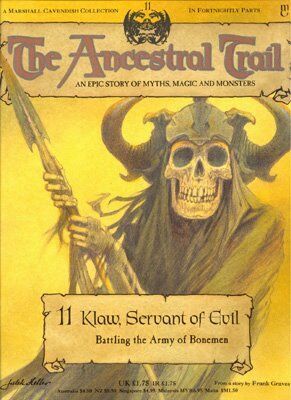 Klaw orders his children to pursue the Chosen One and his friends, and the newly created bone army begins marching down the hill into the gully. Orkan quickly orders his friends to go back up the hill, but as they do Klaw throws more of his tiny bones over the group's head. The bones sprout more bonemen, cutting off the top of the ridge as an escape route. The group tries to use the lining of the gully to escape, but the bonemen are a step ahead of them. Already both groups of bonemen have cut off any possible escape, and it's only a matter of time before the four are surrounded by Klaw's minions. One boneman lunges at Richard with its sword; Richard whips out Juroot's dagger and drives its blade into the soldier's skull. The boneman surprisingly collapses into an untidy heap, defeated. Richard realizes the bonemen are not that strong and he and his friends might have a chance in escaping. Surrounding Kika, Richard and his friends begin to battle any and all advancing bonemen as they try to make their way across the gully. But for each soldier destroyed, Klaw throws out more bones to create more soldiers. Eventually Richard, Orkan, and Melek begin to tire enough that the bonemen begin reaching their weary targets. Each fighter has bruises that hampered their fighting, and it is only a matter of time before the bone army kills them where they stand. Amidst the fighting, Kika asks Orkan for his bow and an arrow. Orkan remarks that they're useless at this range, but Kika uses her Guardian authority to insist. Orkan allows the wasp to take his weapons. With the bow and an arrow in hand, Kika spreads her wings and flaps them furiously, mustering enough strength to hover a little over the battlefield. Klaw sees the Guardian and, determined not to see her escape, pushes aside his minions as easily as if they were paper and aims his spear at the Guardian. Kika, seeing her nemesis approach her, finds the strength to soar higher into the air, dodging Klaw's spear by a hair's breath. Kika then flys off at frightening speed, disappearing in the direction of a distance forest. Orkan cries out that Kika has abandoned them to save herself. Even Richard is stunned, unable to believe that such a seemingly sincere person as Kika, a Guardian, would leave them here to die. Klaw, meanwhile, takes this opportunity to enter the fight. With the trio still gaping in disbelief, Klaw knocks Orkan's sword from his hand and quickly disarms Richard and Melek with ease. He snarls that while he lost the Guardian, he won't make the same mistake with them. Kika is the Guardian of Insects and the Keeper of Goodness. What she lacks in physical strength she more than makes up for in agility and smarts. 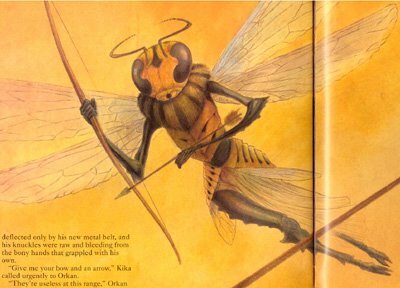 As a giant wasp-like creature, Kika uses her powerful wings to soar to safe distances, where she can take down enemies with her favorite weapons, a blowpipe and darts. She was captured by Klaw, the Evil One's servant, and thrown in a hellish spike-coated pit to die of starvation, but she was saved by Richard and his friends. However, when confronted by Klaw and his bone army, Kika surprisingly flies away from the battle with Orkan's bow. Has she succumbed to the influence of the Evil One...? Klaw is a sinister figure in service to the Evil One. As a skeleton man, Klaw's very appearance gives off an evil aura that intimidates all who face him. By himself, Klaw is more than able to hold his own in a fight thanks to his brute strength and sturdy bone spear. But Klaw possesses a more horrific ability: to call forth an army of bone warriors simply by throwing tiny bones upon the ground. While these bonemen are weak, their great numbers is more than enough to take down an enemy. "Richard looked up at the ridge and saw a sight that sent his heart into his boots. Silhouetted against the sky was a figure wrapped in a torn black shroud. 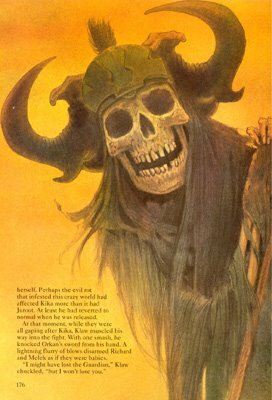 From his horned helmet and his skull-like face to his skeletal feet, there was not one scrap of flesh to be seen. 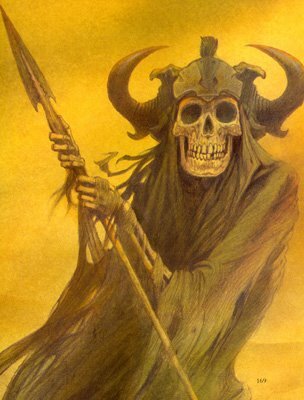 All of the creature, even the spear that he brandished aggressively in the air, looked as if it was made of bone. It could only be Klaw." After surviving the insane and dimwitted Zibella in the previous issue, the eleventh issue of The Ancestral Trail provides a more formidable challenge in the form of Klaw. Along with Ball the Giant Spider, Klaw is perhaps one of the most frightening creatures Richard has faced in the Ancestral World. After all, a walking skeleton, especially one that looks like it's about to devour your flesh, is a universal image of terror. All it needs is rotting flesh and it can be labeled a zombie. While most of Klaw's fighting is done using easily destroyable minions, Klaw is more than capable of fighting himself, and the cliffhanging ending where Klaw looks to be victorious over his prey is one of the more gripping in the series thus far. The series also provides us with another Guardian, this one in the form of Kika. After introducing Juroot way back in issue four, it was only a matter of time before another Guardian was introduced. What makes Kika's scenes interesting is that she apparently betrays Richard and his friends by leaving them in Klaw's grasp to save her own skin. Most people will most likely deny this, saying she must be up to something, but a reader can't shake the the doubt that maybe, just maybe, this series will surprise us. Will Kika redeem herself in the second issue, or has she truly been tainted by the influence of the Evil One in the Ancestral World? Richard: "It seems we should use the rope and have faith that it will be long enough." Orkan: "Melek's the smallest, he'll have a better chance of getting through the spikes." Melek: "All right, but you two had better hold on tight." Kika: "Oh, thank you. I am Kika, the Guardian of Insects. I was trapped by Klaw, the Evil One's servant. He stole my weapons and threw me into that dreadful pit to die." Melek: "Couldn't you have flown out?" Kika: "Remember the spikes? You can't fly very far if your wings are in ribbons." "That's right, run! See where it gets you!" "We might have a chance! They're not as strong as they look. We might be able to fight our way out of here." "She tricked us! She's escaping and leaving us here!" "I might have lost the Guardian, but I won't lose you."